303 Gallery is pleased to announce ParaParticular, our second exhibition of new work by Alicja Kwade. Working with concepts of nature, science, philosophy and perception, Kwade has become renowned for her ability to succinctly question and sublimate natural phenomena, challenging our most basic logical assumptions. Her work uses nature as a tool to investigate senses and awareness, opening fissures in which we may rethink the world around us as well as our place in it. Often using the language of minimalism, Kwade’s work transcends formal concerns and begins to dissolve an object’s materiality, relying on an experiential modus operandi that is both disorienting and startlingly alluring. 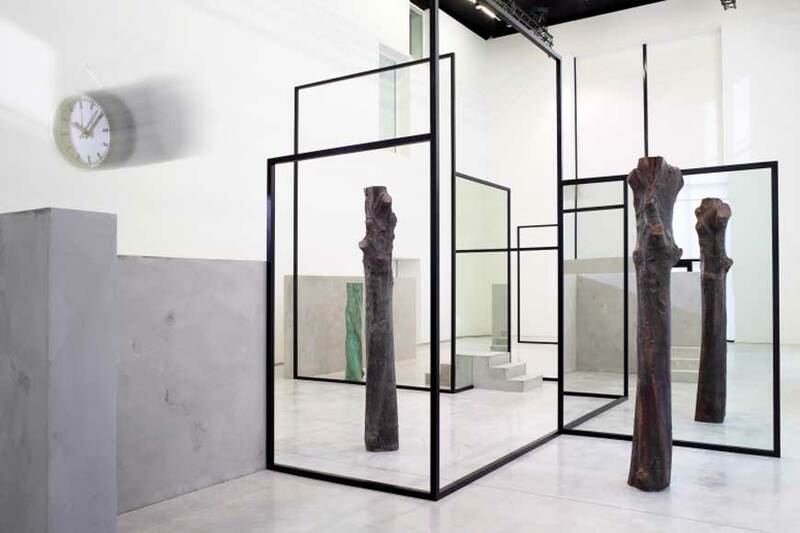 Central to the exhibition is a freestanding scuplture made of interlocking steel frames, weighted with three stones. When looking closely, it becomes apparent that it is the same stone, appearing repeatedly as a copy of itself in varying shapes and thus different conditions. The boulder seems to lose its characteristic form and materiality, negating familiar physical laws. Walking through the frame, the shapes themselves seem mutable and arbitrary vis-a-vis the frame’s interference, with these vacillating perspectives calling into question whether gravity or perception is holding them in place. What is seen and experienced is clouded as physics and human impression collide, creating a type of ur-reality that encompasses both but is beholden exclusively to neither. On the wall, a nine-part mixed media work takes as its starting point the meteorological method for measuring precipitation over time, in terms of accumulation per square meter. A series of white boards are showered with clock hands and single millimeters cut from a folding ruler in a gradual ascension and declension of volume according to their place on the wall. Chronologically, the middle board with the densest concentration of both elements represents a storm at its most powerful, but furthermore the interference of the two systems: time and distance, clock hands and millimeters. The fact that the cut ruler and clock hands are both visually reminiscent of raindrops is a phenomenological ruse that simultaneously restricts and expands their symbolic power. The precise veracity of this format is limited, calling into question how we represent the ephemeral while also being reminded of the beauty and instinctual satisfaction the activity implies. Kwade’s collapsing realities are furthered through her manipulation of nature and science in another sculpture which sees her replicating a boulder undergoing a visual transformation through 3D technology. The work contains eleven states of the stone arranged along the floor, with the original form in the center. Starting from this prototypical boulder while maintaining the same volume in each element, at one side of the row the stones are continuously reduced to a cube, while the other side sees a steady increase in information towards a perfected sphere. The Fibonacci sequence determines the exact shape of each phase, a Golden Ratio actualized. The stones represent themselves and all possibilities in between, a paean to the malleability of the natural world. A similarly explicit visualization of man’s power to mold his environment emerges through abarchairisabarchairisabarchai r (2018), a barstool that is milled out of a solid 10-foot trunk of a poplar tree. Each state of the milling process is visible, as layers cut directly into the tree trunk can be seen gradually becoming a finished stool. This shaving down to reconstitute and manipulate what should be an invariable reality is at the heart of Kwade’s work, hypostatizing our most grounding and reassuring experiences. Alicja Kwade (born in Katowice, Poland in 1979) lives and works in Berlin. 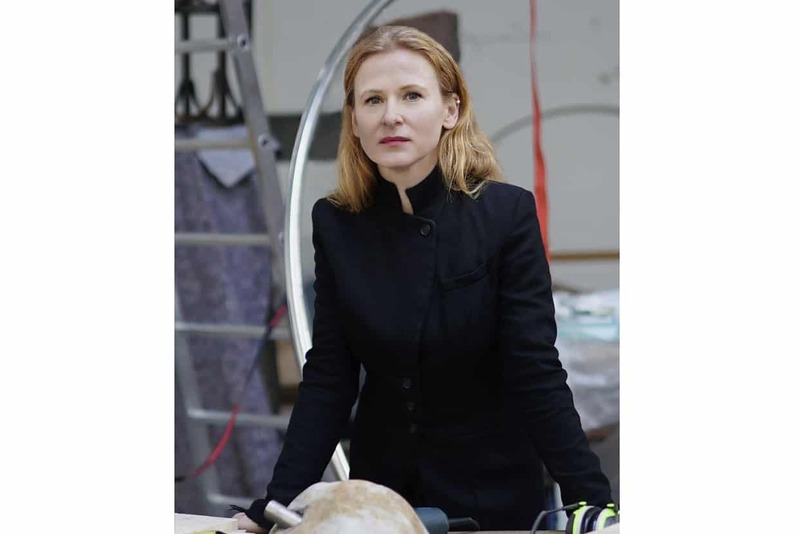 She has been selected for the 2019 Roof Garden Commission and New York’s Metropolitan Museum Of Art. Recent exhibitions include solo shows at Centre de Création Contemporaine Olivier Debré, Tours; Blueproject Foundation, Barcelona; ESPOO MUSEUM OF MODERN ART; Kunsthal Charlottenborg, Copenhagen; Fondazione Giuliani, Rome; Museum Haus Konstruktiv, Zurich; YUZ Museum, Shanghai; de Appel Arts Centre, Amsterdam; Kunsthalle Nürnberg; Kunsthalle Schirn Frankfurt/Main; Haus am Waldsee Berlin; and on the occasion of the award ceremony of the Hectorpreis 2015, at Kunsthalle Mannheim. She has been included in group exhibitions at the Hayward Gallery, London; 57th Venice Biennale; Madam, Luxembourg; Bass Museum of Art, Miami Beach; Kunsthalle Wien; Museum of Contemporary Art Detroit; and CCA Wattis Institute, San Francisco. In 2015-2016, Public Art Fund commissioned “Against the Run,” an installation in New York’s Central Park. Her works belong to many important international private and public collections.